Updated, Jan 18, 2018, 5:12 p.m., to reflect changes as published in EdgeProp Pullout, Issue 814 (Jan 22, 2018). For the whole of 2017, developers sold a total of 10,682 private homes, according to various analysts and URA data released on Jan 15. This marks a 34% increase from the 7,972 units sold in 2016. According to Tricia Song, Colliers International head of research for Singapore, the new-home sales achieved last year were the highest since 2013. 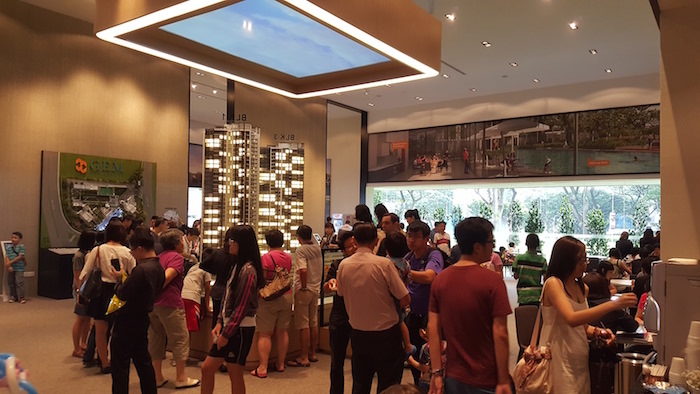 In the traditionally slow month of December, the school holidays and year-end festive season, only 231 new units were released for sale compared with 450 units in November, says Nicholas Mak, executive director at ZACD Group. Meanwhile, newhome sales last month rang in at 431 units, a 45% drop m-o-m compared with the 788 units sold in November. The take-up rate in December, which is almost double the number of units launched for sale (187%), has led to “faster clearance of developers’ inventory of launched and unsold units”, adds Mak. This explains why developers’ inventory of launched and unsold uncompleted private housing units (excluding executive condominiums) decreased further from 2,190 units in November to 2,073 units in December, notes Mak. EL Development’s Symphony Suites in Yishun and Parc Riviera topped new-home sales in December (see Table 1). At Symphony Suites, 50 units were sold at a median price of $1,027 psf, while Parc Riviera saw 44 units snapped up at a median price of $1,223 psf. Both projects were launched earlier — Symphony Suites in February 2015 and Parc Riviera in November 2016. Sing Holdings and Wee Hur Holdings’ Parc Botannia in Sengkang ranked third for the month of December; the developer moved 32 units at a median price of $1,283 psf.